The autonomous cars are coming, and though they might be some while off hitting the high street, TomTom is going to have a big hand in their creation. At an event in Amsterdam today it talked up how important its role will be in autonomous driving - the necessary data for self-driving cars is exactly what TomTom has been collecting for years. "We are good at big data, we started before everyone else and this is why we lead the way today," said TomTom co-founder Corinne Vigreux. TomTom already delivers data to governments and city planners to help with building new roads. "Where should you build this new hospital? How many households will be able to reach it easily?" - these are the sorts of questions TomTom can currently help provide answers to. "We are the ones who invented the first fleet of mapping vans," said Cees van Dok, TomTom's other co-founder. "We're now detecting in three dimensions". Van Dok went on to hint as to what TomTom's role in future vehicles might be, perhaps even before the age of self-driving cars. "We have patents to find a parking spot using real life satellite feeds. It's not available today but soon it will be." "This is the stuff that will make self-driving cars happen", said van Dok. 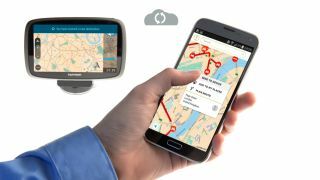 "This is the future that TomTom is preparing for"
That new function might be a while off yet, but TomTom announced another, more immediate feature: MyDrive. MyDrive will let you plan and set your journey on your smartphone, tablet or PC. When you get into your car, that journey will be automatically synced with your TomTom Go sat nav so you can simply put in the keys and drive. TomTom's also opening up its MyDrive feature to developers to play with. The web application is available starting today, but the mobile app won't arrive until next month. MyDrive will, however, only work with specific newer devices. You can see the whole list here.